It is Spring in California! The asparagus is falling of the store shelves and all we want to to is hang out outside (and grill said asparagus). This weekend we are heading to the zoo with Darcy, which I am thinking she will really love. She just started walking, so let's hope she doesn't find the cotton candy vendor and decide she wants to give it a try. One special shout out before we get to the Roundup - Happy Birthday, Chris! People magazine says that Rachael Ray had to learn a new way to talk. Variety interviewed Rachael about the 500th episode of her daytime talk show. Mitzi of A Pinay's Pennies made Shepard's Pie Stuffed Potatoes. Lindsay of Lindsay's Menu made Apple-Cheddar Turkey Burgers. I added that recipe to my list! Priscilla Tsai of Eat My Charlotte tried Rachael's recipe for Barbecued Chinese Chicken Lettuce Wraps. Noble Pig features some gorgeous photography and a review of Rachael's recipe for Roasted Salmon with Lemon-Herb Matzo Crust. April of The Fragrant Hand made Ricotta Pasta with Tomatoes al Forno from 365: No Repeats. Lisa of Lime in the Coconut made Pork-and-Beans Stuffed Peppers. Lauralop of Edible Ventures made Asparagus Penne, which she adapted from Rachael Ray's Big Orange Book. Courtney Mayfield blogged at Krista Kooks to share her experience making Creole Meatloves with Trinitiy Gravy. Eat Me Daily informs us that Cook's Illustrated panned Rachael's stainless steel pans (I love her hard anodized oval pan). Katherine of Smoky Mountain Cafe made Mexican Lasagna. Mindyanna of The Adventures of Mindyanna Jones made Mac-and-Smoked Gouda with Cauliflower. Nurse Heidi of Food for Thought made Quick Tagine Style Chicken. Sweet Tea in Texas features Chicken Chickpea Curry Bowls. 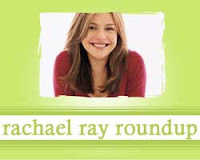 Terribly Write exposes a Rachael Ray impersonator. Hi Madeline! I love your blog. And thanks for linking to mine :). I usually cook a Rachael recipe at least once a week, she is so versatile! Thanks for mentioning Terribly Write and the oh-so obvious attempt at impersonating Rachael by an employee at Yahoo on their website. I thought it was completely outrageous that someone would use Rachael's name -- and couldn't even spell it right. It was a dead giveaway.